Jeremy Evans, 6’9″ forward for the Dallas Mavericks, won the NBA’s “Most Talented” competition as part of this year’s All-Star Weekend. In this competition, players show hidden talents that they have outside of basketball. Other entries included riding a unicycle, juggling, and playing musical instruments. 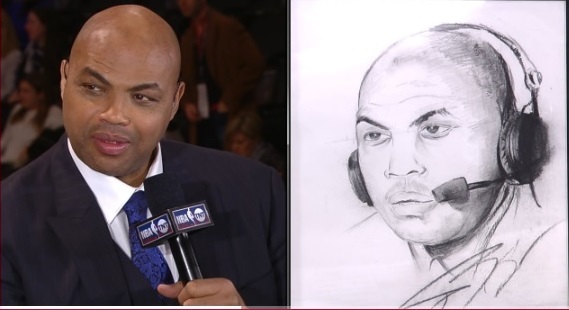 Evan’s was announced as the winner yesterday after he created a portrait of former basketball player and current TNT basketball analyst Charles Barkley. He talks about his entry and shows more of his artwork here. Evans says that his interest in painting and sketching began when he was about 5 years old. He was an interdisciplinary studies major with a concentration in art at Western Kentucky University and he has continued painting throughout his basketball career. During the 2013 NBA All-Star Slam Dunk competition, Evans dunked over a self-portrait of himself dunking. Evans recently posted some of his artwork at Twitter. Visit the Pop Life Art celebrity artists list for links to the artwork of more than 100 singers, actors, musicians, and athletes. This was written by Lorrie. Posted on Sunday, February 14, 2016, at 1:04 pm. Bookmark the permalink.